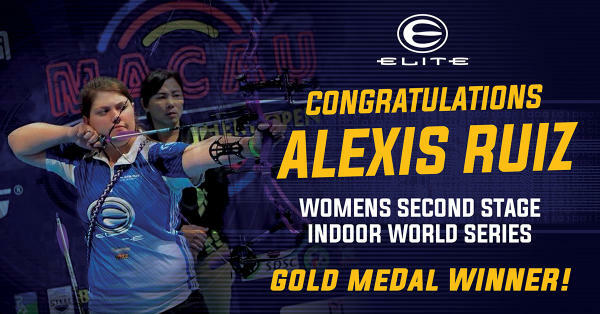 West Henrietta, NY – The second leg of the Indoor Archery World Series took place in Macau, China, where Alexis Ruiz, shooting an Elite Archery VictoryX, impressed the world with a gold medal finish. The series opened in Strassen, Luxembourg as the first of three “250-series” open-entry indoor tournaments. The third international event takes place in Rome, and like the previous tournaments, will draw competitors from around the globe, including as far as Trinidad and Tobago, India and Korea. All entrants will be listed in World Archery’s new open-ranking system, while the top 16 finishers in each discipline will receive points towards their elite ranking, which decides who is invited to the Indoor Archery World Series Final in Las Vegas in February.